Normally you see invisible button or option in all of chat clients. 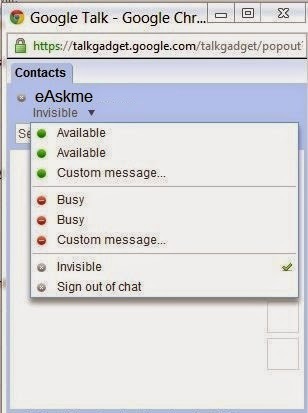 But if you use GTalk you will not find invisible option there, so you will not be able to go invisible. Here we talk about best possible ways to stay invisible in GTalk. Today we will train you to go invisible on GTalk. So if you want to be invisible and talk to only some special people , then follow these methods. Google Talk gadget also give you option to go invisible. It is released by Google and you can find it by clicking HERE. But it is just chat only version. We have already discussed about best multi messenger clients that you can you to access multiple accounts easily same time. These have inbuilt compatibility with Gtalk. These give you option to go invisible. So these are the tips that you can use to be invisible in GTalk. Do share which one you like to use to be invisible. If you like this article do share on Facebook and twitter. Do subscribe eAskme feed to get updates in your inbox.